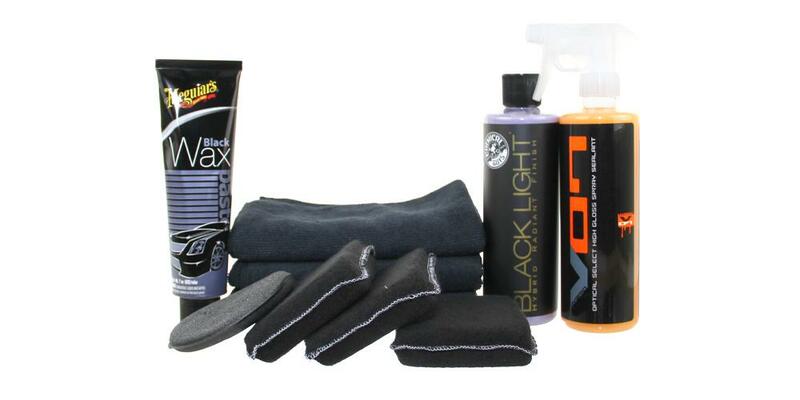 We have hand picked each item in the Black Car Wax Kit because they are highly effective when paired together. To create the best kit possible we utilize our years of detailing experience, combined with input from some of the best detailers around the country. We are confident you will get outstanding results with each item and really enjoy how your vehicle looks afterward. Save $9.42 off of the retail price of individually purchasing these items! Meguiar's Black Wax G620 (7 oz) - clean, polish, and protect your paint in one easy to apply wax! DI Microfiber All Purpose Towel Black (16" x 16") - finally a great black microfiber towel is available to detailers! DI Accessories Terry Cloth Black Applicator Pad - works great with polishes, sealants, waxes, leather care products and more! Here's the regimen I follow for cleaning my black car: use Griots Rinse and Wash (following Garry Dean method), almost weekly. A few weeks ago, I started using the products in this kit: starting with the Meguiars wax. It was easy to apply and remove and the resulting shine was great. Today (a few weeks later), I followed the rinse-n-wash with the Black Light, followed by V7. I followed the directions/videos available at the DI site: very useful. The products were easy to apply and the result is an amazing wet shine: totally awesome! I will surely be following all my weekly rinse-n-wash with V7. I look forward to using these products and the kit was a great introduction. I might suggest adding Lake Country Snappy Clean Boost to the kit to make it truly all-complete.